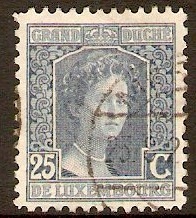 Luxembourg 1914 25c Blue - Grand Duchess Adelaide series. SG177. Fine used 1914 25c Blue - Grand Duchess Adelaide series. SG177. 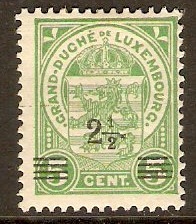 Luxembourg 1916 2½ on 5c Green. SG187. Mounted mint 1916 2½ on 5c Green. SG187. 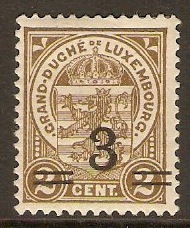 Luxembourg 1916 3 on 2c Grey-brown. SG188. Mounted mint 1916 3 on 2c Grey-brown. SG188. 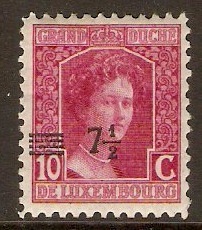 Luxembourg 1916 7½ on 10c Claret. SG189. Mounted mint 1916 7½ on 10c Claret. SG189.